We were ready to get the patient in. At around 3:45 pm, Amy went out to get him in. As the surgery door opened I could hear him having a laugh with Bea. He came in, we exchanged the usual superficial pleasantries, had a laugh. Asked him how he was. He said “Fine, very well thank you”. Soon, was this to change. He told me he had fractured a tooth in the upper right area this morning. There was no pain but it was sharp. I turned round to type this into the clinical notes. I could see that his ASA rating was 1. Nothing medically to worry about. As I was typing, I heard heavy breathing behind me. I turned round and saw his eyes had closed, his right leg was hanging off the side of the dental chair and as I faced him, calling his name and shaking him and lightly slapping his face, the breathing became more laboured. I lowered the chair back right down and called him again. Suddenly he came round and said: “Yes, yes I’m ok”…and then….he was ‘gone’ again. The breathing became more laboured to an alarming level. I asked for the emergency kit and Amy came back with it. He was still breathing heavily. As I attached the pulse oximeter to his finger, his head suddenly came forward, tongue protruded and his breathing become a desperate stridor. His face then went completely purple / ashen. Immediately I instructed Amy to let reception know “Medical Emergency. Cardiac Arrest. Call an Ambulance.” She went straight outside. I noted the time and started CPR immediately. 30 compressions to 2 breaths. At one stage, I vaguely remember thinking part consciously, that If I don’t do this, he will die. It was a battle between death and I and death was not going to take him, not on my watch. I pumped like mad. Amy came back in and brought the AED in. We connected it up and followed the instructions. Bea stayed on the phone in, in case 999 needed to speak to her. “Stand back. Do not touch the patient. Assessing rhythm…..Shock advised…….Press the red button and shock.” I did this and the whole chest arched and lifted off the chair with part of his body. The AED assessed the rhythm again and instructed us to continue to carry out CPR. Meanwhile as Bea had more training in Med Emergency, she came in and Amy went outside to wait for the ambulance. As I carried out compressions, the pulse oximeter showed a pulse of 110 and oxygen content of 70%. This little bit of information was reassuring as our AED did not have a screen with the ECG tracing. The AED instructed again: “Stand back. Do not touch the patient. Assessing rhythm…..Shock advised…….Press the red button and shock.” I followed the instructions. The first paramedic arrived. This was about 11 minutes from the time the patient went into cardiac arrest. I continued CPR. He took over immediately to check the back of the chair was firm enough and immediately said ‘yes’, good. I then took over again as he got his gear out. “Stand back. Do not touch the patient. Assessing rhythm…..Shock advised…….Press the red button and shock.” I did this and the chest arched and lifted off the chair. The AED assessed the rhythm again and instructed us to continue to carry out CPR. Suddenly the patient responded and pushed my hands off his chest! Then went still again. The paramedic was in no hurry to attach his AED. He asked if our AED showed what was happening on a screen. I said no. He seemed happy to continue with our AED at the moment. The AED instructed again: “Stand back. Do not touch the patient. Assessing rhythm…..Shock advised…….Press the red button and shock.” I did this and the chest arched and lifted off the chair. The AED assessed the rhythm again and instructed us to continue to carry out CPR. By now two more paramedic vehicles and the ambulance had arrived. Literally minutes if not seconds, 4 more paramedics came into the surgery. The lead paramedic, the first one who arrived, switched over to his AED which had an ECG tracing. The second lead asked about the medical history of the patient and I informed him it wall all clear. The third paramedic took over external cardiac massage as the second put an IV line in. Sugar level was tested. Negative. It is difficult to recall exactly what happened when and what was done when and in what order. An airway was put in. A drip was set up. At some time I think they also injected something. They did other things I am not sure what. They also attached a contraption that carried out external cardiac massage. As they looked at the ECG I heard the second paramedic say to the lead, “That’s VT” (I think that’s what he said. There was definitely a ‘V’ in his sentence) and this was confirmed by the first. Everyone was instructed to stand away from the patient, they pressed a button, you could hear a ‘whine’ as the defibrillator charged and they shocked the heart again. The ECG tracing went flat and suddenly started up again and I could see what appeared as a more ‘normal’ tracing. Then it took on another pattern again. They were in the surgery for about 1 hr to 1 hr 30 mins. The tracing on the ECG was erratic and inconsistent in that time. Every time they shocked him, the line went flat and then started again. I had to help to deliver the oxygen for a few minutes. In total the patient’s heart was shocked 6 - 7 times. I am sure he had ‘come’ round a few times in that 90 minutes. After the last shock, I cannot say exactly when but I suddenly realised they had stopped the compressions and delivery of oxygen. They were moving around more relaxed. The lead paramedic asked one of the ambulance drivers to bring something in. Then he asked her to bring the stretcher in. I thought: “What, is he…dead?”. They lifted him onto the stretcher with the airway and ‘automatic cardiac massage’ contraption still in place, I think. The airway was definitely in. I suppose in case he needed it again. “He’s OK. Will have to see if he pulls through. Hopefully there is no brain damage. You got the oxygen,…. (he looked at the AED again, which was lying on the surgery floor) …….you had the defib…….you saved his life.” He said nodding. It had not dawned on me at the time the significance of what he was saying. The two remaining paramedics left, saying that they’ll be back to pick up the last remaining paramedic vehicle when they’ve finished at the hospital. The three of us sat down, numb and started talking about the incident. Bea made cups of tea and we sat in the staff room. We agreed we could not have done anymore. When he had been put into the ambulance, Amy said she heard one paramedics say to another that the patient had pulled the airway out. This was put back in then the doors were closed. So it was good, it was reassuring to know that he was alive when he left the surgery to be taken to the hospital. There were no elation and shouts of joy. Just numbness. The shock and disbelief that we had just be part of and witnesses to a full blown cardiac arrest in our dental chair. As Amy and Bea were talking, I remember I had asked one of the paramedics if there was something we should do or someone we should report to. He said there was nothing. If the patient dies, the police will be round to make their enquires and investigate. If he pulls through, we probably won’t hear from anyone. When I look back now, I cannot help but feel what a sad and unacceptable and ridiculous situation the profession has been put into by those who have the authority to ‘rule’ over us but really have been given or taken more authority that they deserve. I have been told by a paramedic that we did the right things and possibly saved someone’s life, at the moment, but instead of elation at a professional stance of doing the right thing, unfortunately I started worrying about whether I had all the right ‘paperwork’, dotted all the ‘i’s and crossed all the ’t’s if there was an investigation! When we finished our tea and I could see we were alright, we went down stairs to tidy up. Bea put a note to order a new set of adult pads for the defibrillator. I checked the oxygen content whilst Amy put the Medical Emergency things away. “We have some news for you. Looked up and smiled. We have him up and talking. He’s actually up and talking. He must have had a massive blood clot in the artery. They are thinking of discharging him in a few days. Well done” as he looked at each of us. The relief from the three of us was palpable in the air. He’s OK! The 2nd paramedic looked at the three of us, then at me in the eyes and said something about CPR, getting the oxygen in then…..
“You had the defib…….YOU SAVED HIS LIFE””, nodding and repeated as he looked round at the three of us: “you saved his life, well done” and smiled. I thanked them for delivering the good news, thanked them for getting here so quickly and for all they had done. We shut the door and elation! The total release of suppressed, involuntary tension. Earlier on once the paramedics had arrived, Bea had cancelled the rest of the patients for the day and evening. I felt they deserved to have the rest of the day off! Fortunately we weren’t seeing patients the next day. They went home. I stayed behind for a bit. Bea and Amy were just great. I could not have asked for better support. This was the first, and last I hope (! ), medical emergency we had to deal with and, for all that, in at the deep end. Amy just carried out unquestioning what she was asked to do. Bea, calmly called the ambulance and handled the reception area. In fact, as Bea was cancelling one of the patients’ appointment, he commended her on how calm she was when talking to him, given what she was in the midst of. We were lucky there were no other patients in then. No one ‘collapsed’ , broke down in tears or freaked out. They both held it together. Just amazing. I will forever be grateful for the regulation that insisted we had Continual Professional Development (CPD) on “Medical Emergency” every year. Every year we had a hands on 3 hours training session and I would also attend an additional lecture session. I was never sure how much of this I actually retained in my head. I made sure we held a medical emergency drill once a month. Only I knew when I would call one. I would always choose a time so we had a different number of staff around. We may miss a month at most but we held the drill regularly. I am in no doubt this was one of five things that affected the outcome. When something like this happens, there is no time to think, no time to work your way through some mental venn diagrams or following the boxes of a mental flowchart. It had to be instinct and what was already in your subconscious. Everyone just went into action. Everything just went so smoothly. The call for the ambulance. Staying online with the 999 operator. Waiting outside for the ambulance. Amy saw him and made a beeline for him. CPR: 30 compressions to 2 breaths. I have no doubts the regular drills helped us all. I did not have to work out if he was breathing or his heart was beating. This just told me …negative. I was lucky to have had these signs. I just started immediate CPR and the ambulance was called. The rapid response I am sure contributed to the outcome. One can never know if one is compressing chest deep enough. You can’t measure the depth of compressions in such situations.In this case the colour of his face instructed me. I could actually see the colour come back to his face. This helped a lot when one is not consciously in a thinking mode and operating on instinct. The enemy to anything we do …….is ‘doubt’. If you start asking yourself, doubting your actions, for anything, it is a recipe for disaster or failure. He was, as I came to know, in VT/VF. I have no doubts the AED contributed to the positive outcome, directly and INDIRECTLY. Before the AED was connected, I was just pumping away but no idea if it was helping. The question always in the back of my mind is if I’m doing the right thing at the right time. 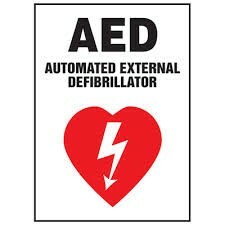 When I connected the AED up, the minute I heard its “voice”, I was immediately aware of a sudden mental, physical and emotional relaxation. It was like having the consultant cardiologist in the surgery. “Stand back…do not touch the patient…assessing rhythm….shock advised….press the red button and shock.” I just thought: My God, his heart is being monitored now. “Somebody” knew what was going on. There is nothing more to do but follow the instructions. It had an immediate calming effect on the whole process. I had wondered if I should buy the AED. I did. We’ve had it for 5 - 6 years now, every day checking the “green ready” light is on, never once thinking we will need it. I have absolutely no regrets in buying it. 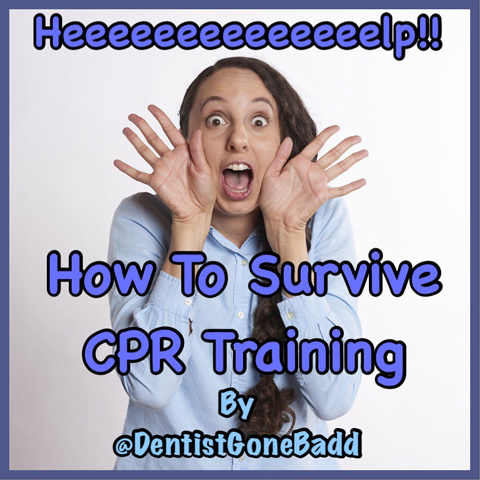 I am well aware that there is still going on a major disagreement amongst professionals whether the AED is necessary in the dental surgery. I will have no hesitation now to say YES. I cannot be more appreciative of the AED. It made the whole incident so much more easy to handle and I will forever be grateful we had one. It actually helped to calm the room. Was it ‘the thing’ that saved his life? I don’t know. I remember hearing at a lecture on Medical Emergencies. I cannot remember who it was. What he said was that we can never fully know exactly what is happening to the heart muscle and how it will respond to anything we do. The patient, to all intents and purposes, is dying or nearly dead. If there is anything we can do that will remotely contribute to a positive outcome….DO IT. Of course there is never absolute certainty in life. The consequences of our actions can never be fully predictable. If one will only act if one is always absolutely certain of the consequences of one’s actions, then one would just sit and do nothing. 1 It really calmed the room whilst we waiting for the paramedics to arrive. 2 As I saw on the ECG screen later, it gave the heart a chance to re-establish a normal rhythm. I HAVE ABSOLUTELY NO DOUBTS THE AED CONTRIBUTED TO THE POSITIVE OUTCOME in this case. Pure luck had a lot to do with it. We were lucky the paramedics were able to arrive so quickly and there were so many. They were just amazing. They went about what they had to do in a calm, confident and controlled manner. We were lucky, before the paramedics arrived, none of us freaked out. I have no doubts the regular drills we had played a large part. One can never say for sure what exactly it is that brought about the positive outcome but I am sure luck played a part in it. There is the disbelief that I was actually deep in the middle of it all. I actually looked at the face of someone who was clinically dead and he pulled through? I came back from the Dentistry Show the day after ‘the event’ and went straight to the surgery, to call the hospital to see how he was. There was a slight eerie feeling going into that empty building, into the surgery. It was all clean, tidy and quiet. I could not help but wonder if 24 hours earlier, did all that really happen? The suddenness of it all is what is so frightening. There were no medical history concerns. One minute he was there, two minutes later he was gone. If he had been in his car, 5 minutes late for his appointment, he would have had it in the car and could have ploughed into a bus stop with men, women and children. I value my life much more now. An appreciation of what I have, life, wife and children,friends and who I am. So much we take for granted. I was surprised how well we all were when we attended to patients two days later. It will take some time for the slight apprehension to dissipate. Is this person going to suddenly have a heart attack on me? The recent developments, all the nonsense, in the dental profession had really got me down. All the effort in having to keep a surgery running with all the nonsense regulatory compliance and then having more piled on, unnecessarily. I had been tired of putting so much effort into working as a dentist and getting so little back in return as the pressure of legislature piled on. I was tired of legislature getting in the way of patient care. This ‘event’ has helped me to see things in perspective. This has been a good boost in morale as at least, all this effort came to fruition. I am very proud of my staff and I hope they are of themselves too. There is a mixture of emotions or feelings in myself. Of course there is an immense feeling of gratefulness that we had a positive outcome. Then, there is the feeling that one has been in a ‘privileged’ place, if that’s the word to use. To have been involved in the thick of things and have a positive outcome. Then there is something else I am aware of. I am not sure how to describe it but it is a good feeling……….there is a deep seated feeling of stillness. I wanted to correct a few inaccuracies so as to be fair to the East Midlands Ambulance Service who did such a fantastic job on the day and to give credit when and where credit is due. In the heat of things, a second can seem like a minute. A minute can seem like three minutes. I was able to download the data from the AED which records an ECG tracing every second. 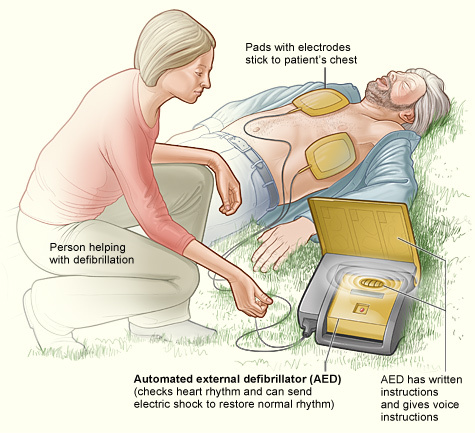 The AED analyses the rhythm every 2 minutes and advises to shock or not. I was able to work out the exact timeline from this. The heart was in VF. CPR was started within 10 seconds of cardiac arrest. The first shock to the heart was within two minutes of cardiac arrest. The first paramedic arrived 5 minutes from the time we dialled 999. The five paramedics were in the surgery for about half an hour when a normal heart rhythm and spontaneous respiration were re-established and the gentleman was taken to the hospital. I have no doubts the rapid sequence of responses added to the positive outcome. The gentleman is alive and leading a full life, no brain damage, no external scars. 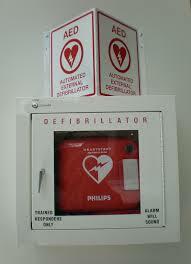 Buy an Automated External Defibrillator and save a life.